Ford Motor Co., is spending $155 million at a Cleveland engine plant and creating 60 positions to be filled by workers being laid off elsewhere later this year. Production will start next month on a new V-6 engine for the 2011 Mustang, a Ford spokeswoman, Marcey Evans, said in an interview. Ford, which has cut its North American workforce 47 percent since 2006, will announce the program today. Ford is spending $1.8 billion overhauling six engine and transmission plants in the U.S., Canada and Mexico. Bringing back furloughed hourly employees or shuffling them among factories helps the Dearborn, Michigan-based automaker hold down labor costs. The 1,260 jobs being added at the engine and transmission factories getting the new investment will go to workers on layoff or being brought from other sites, Evans said. Those coming to the Cleveland engine plant are among those to be laid off when Ford shuts a nearby castings factory, eliminating 700 jobs, she said. Ford is still retrenching as it recovers from $30 billion in losses from 2006 to 2008. The second-largest U.S. automaker had net income of $2.7 billion in 2009, when the predecessors of General Motors Co. and Chrysler Group LLC filed for bankruptcy. 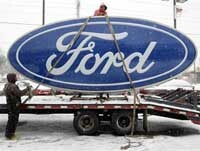 Ford has 600 workers on indefinite layoff. It is cutting a shift of 900 workers in July from a Michigan Mustang factory. Ford has 41,000 U.S. hourly workers. Ford rose 5 cents to $11.78 yesterday in New York Stock Exchange composite trading. The shares have climbed 18 percent this year. Hiring new workers would help Ford close its gap in hourly labor costs with Toyota Motor Corp. Hourly compensation for U.S. workers including wages and benefits averages about $55 at Ford, compared with $50 at Toyota. Ford’s United Auto Workers contract lets the automaker give fewer benefits to new hires and pay them about $14 an hour, half as much as current employees. In addition to Cleveland, Ford is adding new engines at factories in Romeo, Michigan; Chihuahua, Mexico; and Windsor, Ontario, Evans said. It is starting new transmission production at plants in Sharonville, Ohio, and Livonia, Michigan, she said. Previously, the Mustang’s V-6 engine was made in Germany. Business Week has contributed to the report.